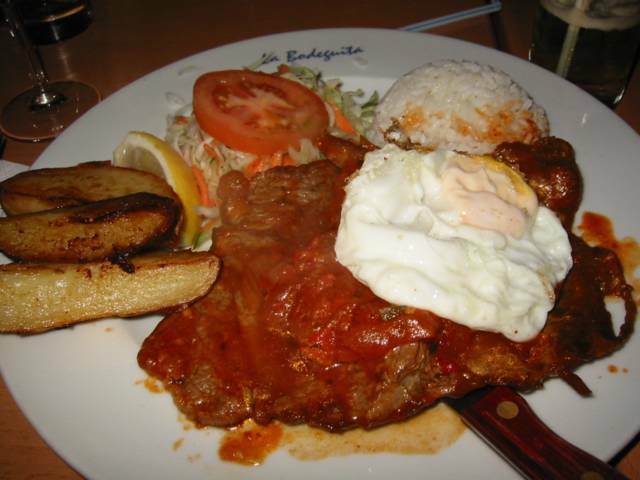 The place me and my colleagues (for our section's Christmas meal) went to is the La Bodeguita in Elephant & Castle, southwest London. It was a non-fancy restaurant, unpretentious, and has matching low price tags. Above left you can see the enormous steak several of us ordered. It's about 12 x 7 inches big. Probably for Americans this is normal but for Londoners used to miniscule servings this is certainly overwhelming. Among 5 who ordered, only one managed to finish it, three of them did not even came close to half of it. Me, I ordered the Bisteck a Caballo just because I'm curious to how this Pinoy food namesake taste. 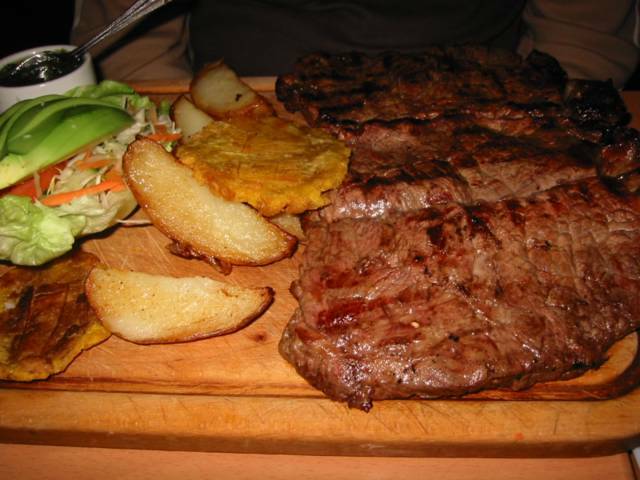 It was okayish nothing to write home about, then again this is the first time I've eaten Colombian food. So I wouldn't know if it's supposed to taste like that. 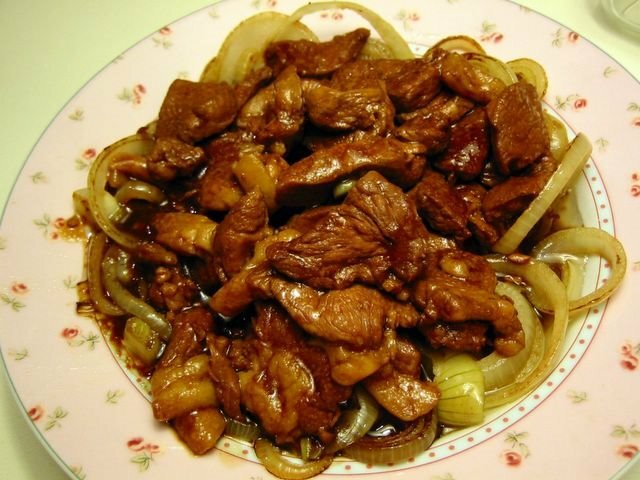 We regularly cook bistek at home specifically pork bistek. That must be a conflicting name, isn't it? Translated literally it's 'pork beef steak' but actually in Pinoy cuisine (as far as I know), bistek is a cooking style where you marinate meat in soy sauce and lemon then pan fried (or grilled or broiled). My mother often cook Bangus (milkfish) Bistek when the Laguna de Bay overflows during typhoons (means an abundance of cheap bangus in the market). Mix soy sauce, lemon juice, garlic, and pepper. Taste mixture and adjust the amount of soy sauce and lemon juice according to your preference. Add pork and marinate for at least 2 hours preferably overnight. Lightly pan fry onion rings in oil. Set aside. Drain pork from marinade and pan fry in the same pan (or grill/broil in oven) according to your preferred doneness. Put in a serving plate with the onion, set aside. Pour marinade into the pan. Add water and cook for about 2 minutes. Taste sauce and adjust seasoning and amount of water. Add the cornstarch mixture, let boil for a few seconds until thick. Pour over the fried meat. Serve. Note: If you grill/broil the meat, make sure you have a pan of hot water underneath the grill to keep the meat moist and tender. Combine the meat, soy sauce, lemon juice, water, ground pepper and garlic (if using) in a pot. Bring to boil and then simmer for about 1.25 hours or until meat is tender. Add more hot water if it is drying up too much. You should have about 1/3 - 1/2 cup sauce left with the meat. Stir in the dissolved cornstarch in the sauce. Bring to boil and cook for about 1 minute. In a pan heat some oil and lightly pan-fry the onions. Remove and place on a serving dish. Dish up meat and sauce on top of the fried onions. Serve.